The world of classical music is undergoing a transformation that has spin-off value for organizations which are trying to improve. The musical transformation involves the art of “collaboration”. Collaboration refers to the interaction between musicians, for example, between pianists and the singers they play for. In the past, the term for the pianist was “accompanist”, and the singer was the “soloist”. The new term for the two individuals is “collaborating artists”. Is this just so much artsy jargon? Indeed no. This change of words is built on a much deeper shift involving roles, relationships, reaching out and results. This shift is instructive to organizations as well. Introducing collaboration also changes the relationship between the two roles. Once the two parties are established on equal footing, each with ideas to contribute for mutual consideration, a new level of teamwork and camaraderie begins to develop. The joint contribution of the spirited two is greater than the sum of the parts. The introduction of collaboration as a role and a relationship, for example between music students, also serves as a model for the music department where the students are being taught. If students are being coached to collaborate, why would professors not reach out over the walls of their particular specialties to make cross-disciplinary contributions? Does it not stand to reason that collaborative collegial critiques would sharpen and deepen the educational process? For example, maybe the music theory teacher has some insights for the music history teacher, and vice versa! The result of a thorough collaborative approach is a well rounded student. Students are empowered by an increased breadth of skill and understanding. Their learning takes on enhanced relevance as they sense they are being prepared for the real world, where soft skills like collaboration can make all the difference in working with people and capitalizing on opportunities. The transformation of relationships, roles and efforts paves the way for successful endeavors. And how does collaboration relate to organizations? An organization seeking to improve will establish true collaboration among its personnel. Regardless of rank, persons will be seen as having ownership of the organization and a vested interest in excellence. A collaborative spirit will encourage each person to give of their best, while supporting the best of others. Persons, led by the leaders, will let down the walls of their departmental silos which so easily get built up to protect individual’s sense of value, in order to create more value for the organization as a whole. Collaboration = roles, relationships, reaching out >>> results! I recall a play I was in during Grade 3. I was a magician. One of my key lines was “Questions, questions, whose got the question?”, or words to that effect. I recently encountered two good articles about questions. One of them, written by a pastor, suggested that a healthy organization needs to get down to brass tacks and ask the “why” questions. Another article, by a team facilitator, suggested that “why” questions close down conversation and that “what” and “how” questions are better for provoking discussion. Both observations are true in my experience. I believe, however, that the “why” questions are the highest form of inquiry. I agree that they can be difficult and they can turn people away. Are there ways to ask “why” which are accessible to those of us who don’t consider ourselves philosophers or deep thinkers? “How” does one ask the “why” questions? Let me suggest some practical ways to ask the “why questions”. One set of questions proceeds from the rational brain. A business or service might ask “What is our value proposition?” If a tutoring organization, for example, identifies its value proposition as providing a high quality teaching service to help students who fall through the cracks, it has identified at least part of its “why”. This definition may be further sharpened by contrasting its value propositions with those of similar organizations. For example, the tutoring service may choose to provide its services to new immigrants, as opposed to non-immigrant clients. Another way to get at “why” rationally is to ask “What is the reason we exist?” Or, “If we weren’t a player in the field, what would the game be missing? A camp, for example, might identify that it is the only camp near a major population centre which offers an overnight campout experience. The rational approach can also lead to questioning assumptions. Is the stated purpose still relevant, sufficient, meaningful? The rational act of clarification can also be helpful in answering the “why” question. What is not our “why”? The camp above might identify that it is not in the family camp business. Another clarification is to discern which category of human endeavour an organization is pursuing. Is the organization, for example, a social service or a business. If it is a social service, does the organization relate to families or individuals? Identifying the customer segments one serves can also cast light on the “why”. Is the local medical clinic primarily serving the needs of the local people, or the province? And it can be helpful to separate “what” and “how” from “why” we do what we do. The clinic may use the best in technology and have good collegial relations, but as a medical clinic it is still about providing for the health needs of the community. The emotional brain also offers a unique perspective on “why”. The question “what was the passion at the beginning of our operation?” can open up a connection to the deeply held motives of the founders. A church, for example, might have been founded as a renewal effort focusing on education and outreach. The related question “what is the passion now” night lead to new discoveries. Perhaps that same church is now, in fact, passionate about worship. And moving to the non verbal side of the equation, what does the logo say about purpose? Why, for example, does the Tim Horton’s logo, which could be described as outdated, communicate so well that the purpose of the store is to provide a refreshing break for a legitimate treat? Other emotional approaches might include examining the story of the organization. Where has it shifted direction, or run aground, or thrived? Where has it taken key decisions? These may relate to the “why” question. Perhaps the “why” question is uncomfortable because it touches on values and idealism. But values are foundational to any enterprise. Schools, for example, must believe in helping children grow. That is not to say that we don’t need a dose of reality to make our “why’s” attainable. We may not be able to give each child all the gadgets that assist education, but we can enthuse them about learning in a loving environment. The “why” question may shut down conversation in a setting where quick answers are needed. But it is essential for the health of an organization. What are some other ways of asking “why”? My wife and I enjoy backpacking in the mountains each summer. This year was no exception, as we feasted our eyes on some of the most spectacular sights the Canadian Rockies have to offer. 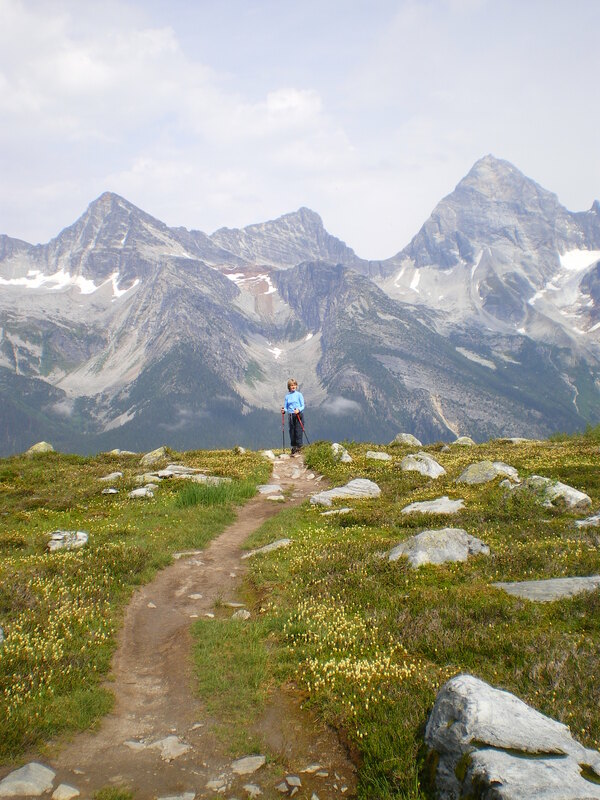 We added Snowbird Pass in Mount Robson Provincial Park to our collection of visual gems visited. We also lost a gem on that trip. At some point, the diamond in my wife’s wedding ring fell out. Perhaps the ring’s claws had worn down. Any vigorous activity or contact with rocks or trees could have jarred the stone loose. There was no point in searching for the diamond, as it would be impossible to find such a tiny jewel amidst the gravel and grit of the trail. I was grieved to think of a precious stone hidden forever under the rubble of a mountain trail. This led me to think about personal accomplishments. Our achievements can also quickly and totally disappear from sight. What if my most cherished achievements don’t outlive me, or don’t even accompany me to my later years? Could they be buried by history? Could they be lost as the context changes? I am comforted by the teachings of Jesus. Jesus taught that truly important deeds will be remembered and rewarded. Jesus said that the jewels and diamonds that will attract his attention are selfless acts such as giving drink to the thirsty and clothing to the naked. Even if we forget having done these things, perhaps undervaluing their importance, Jesus will remember that these deeds sparkled for Him. Moreover, these deeds, when done in love, will flow out of a life dedicated not to achievement, but to Jesus himself. The output of those who have chosen to devote themselves to Jesus is like diamonds sparkling in the sun. Those diamonds won’t get lost!